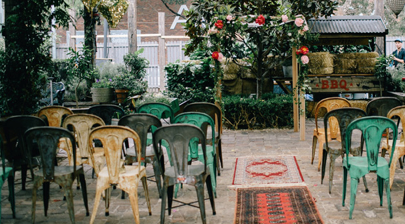 Based in St Leonards this charming venue mixes the buildings industrial heritage and a modern fit out with aplomb. As a result the owner, Sicilian-born award-winning chef Lino Sauro of Gattopardo & Singapores Garibaldi fame, has successfully created this gorgeous Mediterranean themed restaurant. Sauro transformed the Old Rum Store into a contemporary indoor dining space plus a lush rooftop terrace. Olio is a luxurious space that offers 2 event spaces that can cater for both banquet and cocktail style parties. Ahh The Grounds... We have a very long list of things we love about this place: the Potting Shed, the Atrium indoor garden, the markets they host every weekend (http://thegrounds.com.au/the-grounds-markets/stall-holders/ ), the Nutella donuts, the Garden, the Arbour, the Arbour at night, the French inspired patisserie, high tea in the Arbour surrounded with Bougainvilleas, the orange martinis, the pet pig Kevin Bacon, the coffee cart, the weddings they style effortlessly, the menu, did we mention the Arbour? Man-o-man this place is dripping in style and will surely make your event one to remember. Found on the third floor of the Old Rum Store, this pop up venue is flooded with natural light. The raw, open space provides a blank canvas for you to style your event any way your choose with available furniture both classy and functional. A Private Kitchen is set up 3 stories with a terrace that wraps around the building offering a urban grungy view down Kensington street creating a contemporary relaxed venue with plenty of styling options. The real calling card for the private kitchen, though, is the pop up nature of the space, allowing businesses, brands and groups a chance to have events catered by visiting international chefs. Want to virtually walk through some other unique venues? Visit Venue Insider and take a 360-degree tour through some amazing spaces.